Just a quick post, because I’m actually stuck at a conference for most of the weekend, but here’s the video that I’ve been promising forever. Sorry about the wait, and the lack of posts – more to come Monday! These twin babies obviously have a special bond with their own personal Frenchie, Zaboo. Face licking Frenchie plus giggling babies equals fun, fun, fun. 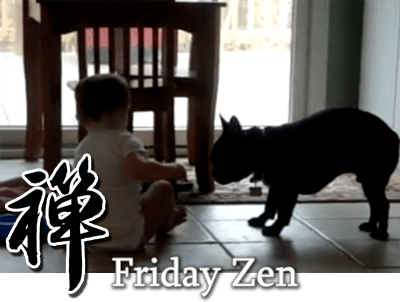 Normally, I would preface any video about dog/kid interaction with some caveats, but let’s just assume that anyone watching this already knows all the stuff about supervised play, etc etc. Can we ever get tired of seeing videos of Sharky the Pit Bull and his beloved baby bunny? Enjoy the rest of Sharky’s videos here. I’m living vicariously through my friend Paula’s Bullmastiff puppies, since I can NOT wrap my head around having a litter of puppies that will be as large at eight weeks as my crew are fully grown. Here’s video of Paula’s pups at 2 weeks and change. You can learn more about her dogs over on her website. Are you all out shopping? I bet you are. I hope you got in line early, early early and scored some good stuff. In any case, here’s something to be thankful for – Frenchie babies and kitty cats.